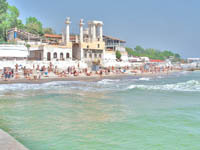 «Langeron» is the oldest beach in Odessa. In the 19th century a summerhouse of the famous general-governor of the Novorossiyskyy region count Langeron was situated in this picturesque area. Many famous guests of Langeron visited this place. Lanzheron donated his summerhouse fall to the city and a public beach was established. Unfortunately, the summerhouse has not been preserved. The territory experienced landslides during the last 200 years. The only remaining part of Langeron estate is the arch, which is still standing at the entrance of the beach, which starts just after the seaport boundary. «Otrada» beach is situated now on the former villa territory of a Greek merchant Halaidzhoguelu, named �Villa Otrada�. Now, it is one of the central beaches of the city. You can reach the beach walking down from the Franzuskyy Boulevard along the Asarov Avenue. One of the sightseeing interests of Otrada beach is the funicular railway. You can take ride in a small nostalgic carriage for apprximately US$1.50, which lasts about five minutes. On the beach area there is a restaurant named �Villa Otrada� and the Otrada Beach Club, which has green lawns and a swimming pool within a closed territory. To the right of the beach, you can see a Yacht club where you can rent a boat or a yacht for a sea voyage. 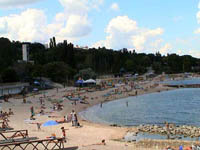 «Dolphin» beach is a youth beach. It is very popular among students as there are many student hostels close to this area. All summer, students are preparing for their examinations or re-examinations on the seacoast getting a nice tan at the same time. The infrastructure is well developed with good parking. There is a nearby lift if you do not want to walk up be the stairs after relaxing under a hot day. 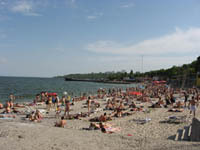 «Arcadia» beach is the most lively, noisy and most beautiful beach in the western part of the Odessa. In the beginning of 20th century an enterprising Odessa businessman built a luxurious restaurant on piles. The �Arcadia� restaurant became popular among the rich people and the same name was given to a small beach close to the restaurant. Now Arcadia is not only a beach name but also it is a part of the city. Many hotels, sanatoriums are situated in this part of the city. A lively alley surrounded with various cafes, park amusements, and sales outlets leads you to the sea. Here you can find also the most popular summer nightclubs. �Golden youth� of Odessa and Kiev live in Arcadia the whole summer. Here you can find everything for your unforgettable holidays: clean golden sand, sea, music for any taste and cooking from the entire world. ���� ���������� ���������� �� ������ �� ������ ������ � ������� ����������. �� ���������� ����� ����� ����������� 5 ������ ������ ������. �����������, ������ ��������������, �� ����� ��������� ����� ������������ �����, � ���������� ������ ���� �� ����� �� ��� ������� � �� ��������� �����������. � ���� ����� ��� � ����� ��������� ������ ��������� ������ ��������� ��������� ����������� - ������� ����������. ������� ������ ��������� ����� �� ������ �������. �������� ����� ������ ���� ���������� �������� �������� ���������� ��������, ���������� �� ��������, ����� ����� ���������. � ��������� ����� ����� �������� ������� ������������ ����� ������� ������ �������� ������ 8-��, 10-��, 11-�� � �.�. ������� �������� �������. �� ������ ������������ �������� �� ���� �� ��������, "�������", ������� � ���� ������ � ��������. ����� ����� ��������� ������� �������� ����������� ����, ������������, ���������. �� 8-�� ������� ��������� ���������� "�����������", ��� � ������������� �������� ����� � ���� � ��������. �� 12-�� ������� ���������� ������ ���������� ���, ��������, ���� ����� ��������� �� �������� ���������� ������������.